Shopping for Super 8 Prop Replicas? If Aliens made LEGO, this is what they'd look like. From J.J. Abram's sci-fi thriller Super 8, and using the 3-D solid model files used to create the screen-used props, QMx has created an exact replica of the Argus Cube in passive mode. With a polystone core, the exterior of the cube is plated with a smooth pearlescent coating, perfectly replicating the semi-organic, semi-metallic finish of the hero prop. The cube itself measures 2-inches on each side and weighs about 8-ounces. The Argus Cube comes in a special crate box as seen in the movie! The Argus Cube, so named by the scientist studying the only alien ever to be captured alive, is a biomechanical miracle. Each cube is an organic magnet, capable of reassembling itself on an atomic level to fit almost any purpose. The cubes, which appear in the movie, Super 8, are the building blocks of the alien's spaceship. 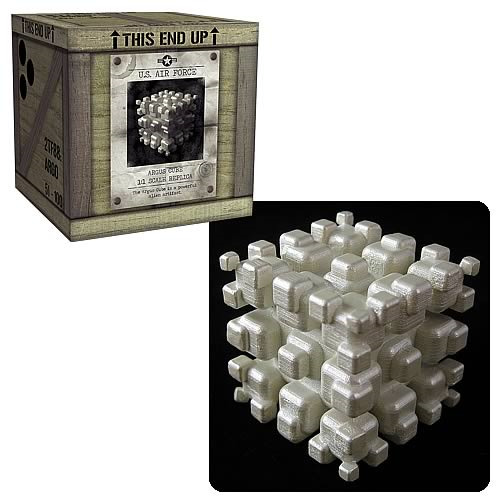 Essentially indestructible, thousands of cubes were recovered when the ship crashed on earth in the 1950s. Scientists studying the cubes couldn't determine their function until they applied an electrical charge that caused the cubes to momentarily form a part of the ship. Ages 14 and up.